click: Place 1 power counter on Temple of the Liberated Mind. Hosted power counter: Gain click. Use this ability only on your turn and only once per turn. 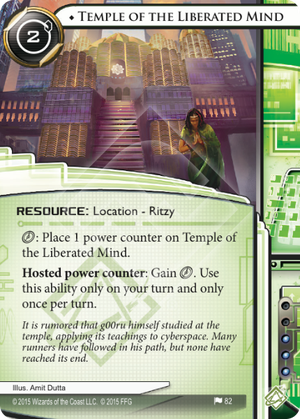 The Runner uses a power counter from Temple of the Liberated Mind in turn step 1.1 (before "Turn begins") or step 2.3 (before "End of turn"). Can the gained be spent on actions at either of these times? The Runner cannot spend clicks on taking actions until "Take actions" during step 1.4 of their turn. Before that step of the turn, clicks can still be lost or spent through card effects, such as Wyldside or Bioroid ice during a run initiated by a card effect. A click gained during step 2.3 after the action phase does not return the runner to the action phase, and it will not be available to spend until the Runner’s next action phase because clicks can only be gained or spent during a player’s own turn. However, it can still be lost by card effects (for example, if the Corp plays An Offer You Can't Refuse and resolves the first subroutine on an Enigma). So this card rarely seems to get used. That's odd since it's not a bad card. You pay 2 to move a click from one turn to another. A five click turn is ideal for Encore, Exploit, Notoriety (while it lasts) and Apocalypse. It also works well with cards of the form "install only if you've successfully made a run on ... this turn". Yes, I know about Hyperdriver, I see a few important differences though. Hyperdriver is optimal for "win the game" turns since you can install a few of them on Dhegdheers and then pop them all when the time is right. Hyperdriver also gives you clicks for free whereas Temple of the Liberated Mind only moves them. Temple of the Liberated Mind is at its best when you need just one more click but you regularly have turns in which you need that. If you have a bit slower deck with drip economy it can make sense to use some of the turns around the midgame when the corp has locked you out to charge up and once you've gathered enough money hit the corp with extra clicks. Don't get me wrong, I understand very well that Hyperdriver is the better card. But Temple of the Liberated Mind is not a weak card in the sense that it delivers too little for its effect. Rather it's a tool that makes certain decks just a little more efficient.